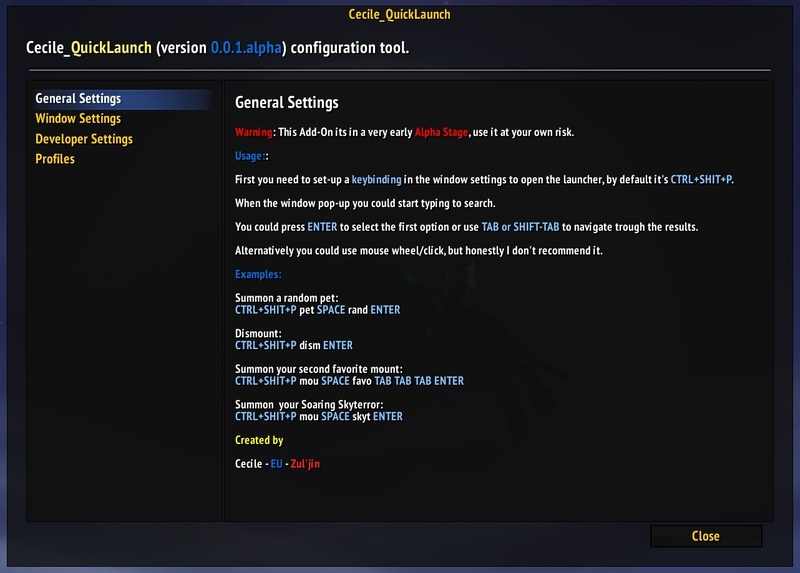 First you need to set-up a keybinding in the window settings to open the launcher, by default it's CTRL+SHIFT+P. When the window pop-up you could start typing to search. You could press ENTER to select the first option or use TAB or SHIFT-TAB to navigate trough the results. Alternatively you could use arrow keys or mouse wheel. You could define Aliases and Blacklist items in the search options. The different search modules could be customized in the module list within the search options. The window appearance could be change in the windows options. This AddOn include a minimap icon and some slash commands. - Browse complete and uncompleted achievements and open achievements interface UI. - Open AddOns configurations windows. 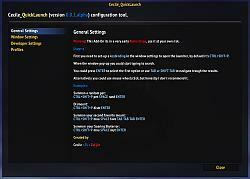 - Use any of your character or account macros. - Summon random or any favorite or not favorite mount. - Open your professions book or use your professions skills. - Summon random or any favorite or not favorite companion pet. - Change Specialization and gear sets. - Friends whisper and invite to party/raid. Convert to party/raid. - Use any favorite or not favorite toys. - Cast your abilities, teleports, portals, summons, buffs, etc. - Use any object in your bags or equipped by your character. - Now auto equip set on spec change happen actually at spec change! - Added AddOns configurations search module. - Now pets with custom name display both, specie and custom name. - Merging words, for example searching 'mount mo' is like searching 'mo'. - Added the ability to add aliases in the search options. - Added two aliases : cfg for Addon Config and cql for Cecile_QuickLaunch. - Added Options to enable / disable modules. - Mounts Module now could be customize. - Pets Module now could be customize. Great addon, really neat functionality, have you considered adding Toys into the list? Yes but haven't get a change to do it yet. Last edited by Magicloth : 09-25-15 at 12:25 PM.